The Asiana Bridal Show is back in London for 2011 with their asian bridal exhibition and fabulous fashion show taking place on Sunday 30th January at the Park Plaza Riverbank Hotel in London. I'm a big fan of the Asiana Bridal show, and I'd go as far as saying out of all the wedding shows I've attended in the UK this one puts all the others to shame! I didn't attend the London show last year, but I'm booked in this year and thanks to the team at Asiana Magazine, one lucky Asianfashionblog.co.uk reader and their guest have the opportunity to join me, including much-coveted front row tickets for the fashion show! Which world-famous fashion designer's clothes are featured on page 138 of the latest Asiana Wedding Magazine. Send your answer in via email, stating "Asiana Competition" in the subject line along with your full name, address and phone number. The competition will be closing at midnight on Friday 14th January, when a winner will be picked at random and contacted the next day. With more than 90 exclusive exhibitors at one of central London’s swankiest hotels, you’ll be sure to find your dream wedding dress, a matching outfit for your groom, along with all the other essential service providers to complete your big day. The 2011 asian bridal catwalk, features Bridalwear Collections by Mongas, Ekta Solanki, Kiran Khan, RDC, Gul’s Styles, Roshans, Khushboos and Sonas, Menswear by Ziggi Studio and Jewellery by Kyles Collection. 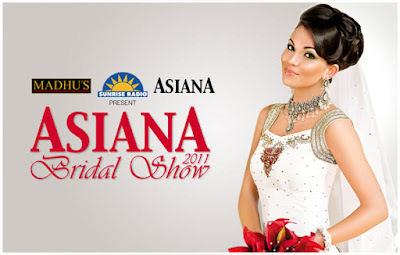 Tickets for the Asiana Bridal Show 2011 are also available to buy online from AsianaTickets.com, at £11 for entry to the exhibition and £21 for exhibition and fashion show. Visit the Asiana Bridal 2011 microsite for more information and don't forget to enter the competition to win tickets!